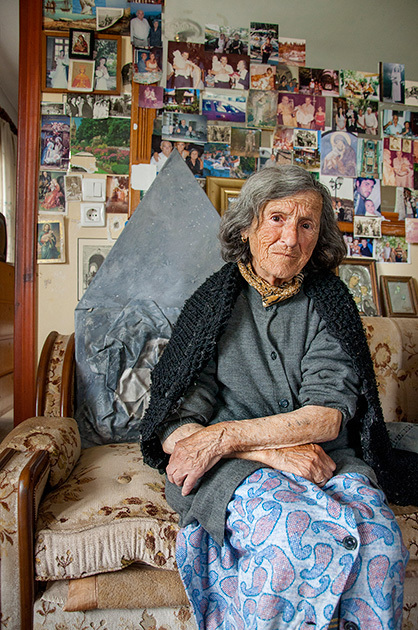 With ages between 89 and 104, the subjects of these photographic portraits are released in a dynamic silence. For Artemis Alcalay every meeting was a personal submersion as well as an opening, each time in a different world. She found herself with these heroic everyday figures, which carry the number of the Camp on the arm, “a sign that directs the trauma, that activates the memory”. Her need to meet the Greek Jewish survivors of the Holocaust, extends her eye over what has propelled her over the last few years as an artistic creator; namely a study on the ‘home’, the house, the habitat, the memory, the loss, the trauma and the healing. The soothing effect of the shape, the presence and symbolism of the little ‘house’ which like a toy changed the codes of stereotyped communication and led to a series of portraits like allegories around the meaning of geography, family and spiritual ‘home’. For Artemis Alcalay the issue is the exposure of the spiritual plane and the unique meaning of each person in a field of interaction that may extend, communicate and bring about a blending and reflection even beyond the Jewish identity. To be an active figure that talks about the human condition and the need for a way to happiness or oblivion. Today, these fragile figures are a connection not only with the past but also with something beyond time and History. They are a huge family portrait in which we are all mirrored.